The GDPR - General Data Protection Regulation is a topical issue. 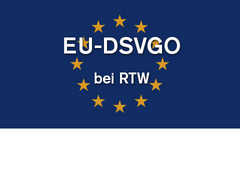 RTW also appointed a data protection officer, and we are reviewing our present way of collecting and storing of personal data in compliance with the GDPR. The results and the consequential adjustments will be added to our already existing detailed data privacy statement. If you want to get information about your stored data and their use, we will make these information available via e-mail or letter mail.